WOW! Have you seen the Eastern Palace Bundles that are currently on offer for Customers, both of which include FREE PRODUCT!! They are the most amazing kits and so versatile, with so much you can do with just the Products in the Bundles, why would you need to think further than that. But you know me, I like to get the most out of every product and not just work in the Box. This also gives me an excuse to show you some of the other new products that are heading your way in June. So, the video shows you two versions of the same card; one is more masculine and the other has ‘girly’ written all over it. They are both bright and bold, just right for the season, but very different looks. In the video I go through the product in both the Eastern Palace Bundles, which I hope you find helpful, but the BIG MESSAGE is that if you are looking at buying the Premier Bundle (and who wouldn’t), then you really MUST buy the Starter Kit. For just 5 pence more you can get an extra £31.05 of product, including items from the Demonstrator only Pre-Order List. You will then get to choose even more new product in your first order as a Demonstrator, but AT A DISCOUNT!! You know it makes sense, and there really is no pressure to hold parties/workshops etc, although we would love it if you did, there is no requirement to do so. Please contact me to discuss this option. I am happy to hear from you by phone or email, just pop over to my Contact Me Page for these. 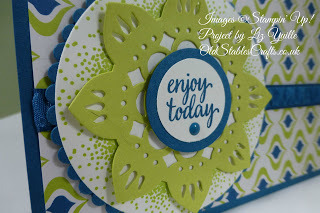 « Daisy Delight Sneak Peek!